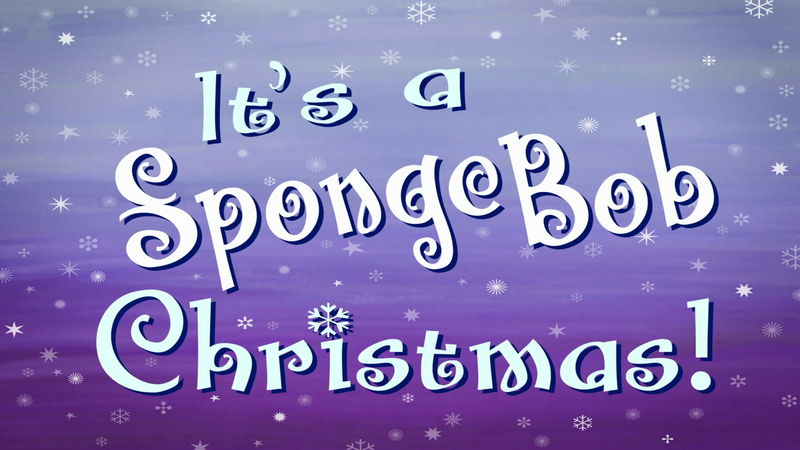 SpongeBuddy Mania - SpongeBob Transcripts - It's a SpongeBob Christmas! Potty: Do you even know how to get to the North Pole? Patchy: (Getting back in the driver's seat) Oh, Potty, you silly parrot, everybody knows that the directions to the North Pole are right in the lyrics of the song “Jingle Bells”. (He starts the truck, and begins to sing) Dashing through the snow (mumbles the next line), through the fields we go, fa la la la la! OK, so we're looking for some fields, then. Potty: No, Patchy, the directions to the North Pole are in the song “There Goes Santa Claus”. (He sings) There goes Santa Claus, there goes Santa Claus, right down Santa Claus Drive. Scurvy brain. Patchy: Yeah, well we ain't turning 'til we see some fields! Potty: Look out, there's a fork in the road! Patchy: I don't see no fork. Patchy: While we wait for the truck to stop spinning, let's see what SpongeBob is up to this Christmas. SpongeBob: (Singing) Oh, it's drawing very near; my favorite time of year! The snow is falling and the cold wind blows … Christmas is almost here! (He springs from his diving board through the roof of his house and pulls out some Christmas lights) And I know that Santa, Santa, Santa has his jolly little eyes on me! It keeps me warm and filled with glee to know Santa has his eyes on me! (He wraps the lights around his pineapple) I light my house like a Christmas tree, falalalala lalalalalali (he spins the door handle, which turns into a Christmas wreath) 'cause Santa, Santa, Santa has his jolly little (a Santa hat appears on his head) eyes on me! (He walks next door to Squidward's house) Hi, Squidward, what are you doing today? Squidward: Stringing lights so Santa knows in no uncertain terms to GO AWAY! SpongeBob: OK. (He continues on to Patrick's house) Santa, Santa, Santa has his jolly little eyes on me! He sees everything I do with his left eye on me and his right eye on you. (He notices Patrick's cardboard box trap which is baited with a Christmas cookie) Oooh, what's that? Patrick: It's a trap. A trap for Santa! SpongeBob: Oooh, baited with Christmas treats? SpongeBob: Oooh, Santa, Santa, Santa has his jolly little eyes on me (he skips again), falalalala lalalali and who is that I see underneath her Christmas tree? Sandy: (Sings) Oh Christmas, oh Christmas's sweet mystery, I'll mix a dash of Christmas cheer with a candy cane (she does so) and de-construct it's alchemy. SpongeBob: (Skips to the Krusty Krab) Santa, Santa, Santa has his jolly little eyes on me. Hi, Mr Krabs! Are you ready for Christmas? Mr Krabs: Why, Christmas is my favorite time of the year. After all, 'tis the season of getting. SpongeBob: Don't you mean the season of giving? Mr Krabs: Exactly; the more you give, the more I get! Plankton: (Sings) Oh, Santa, Santa, Santa has his eye on me. He sees everything I've done, every plot, plan and scheme. It's just a bit of fun, Santa has his eye on me. Every naughty deed (holds up a scroll) is written in his scroll, so every Christmas morning (he empties coal from his stocking) I get a stocking full of coal! Karen: Maybe you would get a real present from Santa if you weren't the biggest jerk in Bikini Bottom. Plankton: Hehe. The Jerkmaker 9000 will make doling out tainted fruitcake a breeze. Now, who's gonna be my first victim? SpongeBob: Hey, Plankton, what you got there? Hey – is that a fruitcake dispenser? You don't suppose I could have a piece, do ya? Plankton: Sure thing, Fruitcake. Here ya go! (He pulls a lever and a mechanical arm extends with a plate of fruitcake) Hot from the oven and full of lovin'! SpongeBob: (Picks it up) Oooh, hot hot hot! (He takes a bite) Wow, this is great! Plankton: So, how do you feel? Kinda cranky? Plankton: Maybe just a little bit jerky? SpongeBob: No. I feel just like this cake tastes – absolutely delicious! SpongeBob: Don't mind if I do. (He eats it) Mmmm. Plankton: How's your dander, is it up? Taste bud: Oh boy, here comes some more! Yaaaay! Plankton: Grrr! Have some more! (He fires a piece into SpongeBob's mouth) Have a whole loaf! (The arm stuffs a loaf into SpongeBob's mouth) Have a baker's dozen! (He fires many fruitcakes at SpongeBob) Well? SpongeBob: Well … (He swallows) I think everyone should taste your amazing fruitcake! SpongeBob: (Rides the dispenser up to 3 carollers) Hello, fellow revellers! Would you like a Christmas treat? Fish 2: Yeah, who doesn't like treats? Fish 2: It's like a present for my mouth! SpongeBob: I knew you'd like it. Bill: (Turns into a jerk) Hey, did we come here to sing or eat fancy cake? Fish 2: Whoa, calm down Bill! What do you want to sing? Fish 3: (Turns into a jerk) No, hold your holly! We're singing the best Christmas song ever, and that's “Silver Bells”! SpongeBob: (Driving away, unaware that they have been poisoned with jerktonium) Great to see people so passionate about the holidays. Plankton: (Emerges from the Chum Bucket on a unicycle) What's all the racket? What do you know, the jerktonium seems to work on these jerks. Very interesting. SpongeBob: Everyone can get behind a mouthful of warm sunshine, everyone eat a Christmas time cliché. (People start turning into jerks; somebody pops a kid's balloon, another person smashes a gift over somebody's head, Pearl squirts water at passers by) Everyone can get behind a mouthful of Christmas time, let's all eat some hot fruitcake today! Plankton: (Cycling through the rioting town) This just keeps getting better and better. Santa: (On a float, with a boy on his knee) Ho ho ho! So, little boy, what would you like for Christmas? Boy: (Bouncing on Santa's belly) Weeee! Oh yeah, and I want a trampoline! Plankton: Success! Soon all the Bikini Bottomites will be jerks! Now I just need to figure out what to do about old SpongeBoy. Karen: Once again your master plan is fatally flawed. (She brings up a diagram) It seems that SpongeBob's innocent love of the holidays shields his heart from the effects of jerktonium. SpongeBob Diagram: Dahaha! That tickles. Plankton: Oh, SpongeBob, you've been a bad, bad toy! Patchy: I can't believe we survived that horrifying car accident without a scratch. (He gets out of the truck and slips on the ice) Ow! (He notices the fork in the tire) Aw, here's the problem. Oh, that's not good. Flat tire, huh? Looks as sad as an empty bag of beef. Brrr! It's cold up here. Why don't you kids at home go make a nice hot cup of cocoa while Potty builds me a fire. Potty: Squawk! What are you doing? Patchy: I'm sorry, Potty, I don't know what got into me. I'm just so hungry! Patchy: Why are you looking at me like that, bird? (Potty pecks at his head) What are you doing? Bill: Ah, go stuff a stocking! SpongeBob: Gee, that wasn't very nice. (He drives past Mr Krabs, who is mending the Krusty Krab sign) Seasons greetings, Mr Krabs! Mr Krabs: Well you've got some nerve, SpongeBob! This is coming out of your salary! SpongeBob: What's that all about? (He drives up to Patrick, who is setting another trap) Hey, Patrick! What're you up to? Patrick: I think it's pretty obvious, SpongeBob! (He eats a slice of cake) I'm eating fruitcake and setting a tiger trap for Santa! Now, if you don't mind, I'm kind of busy right now. SpongeBob: Yeesh, OK. Don't have to be a jerk about it. Everybody's on edge today … must be the holiday jitters. SpongeBob: (Stepping out of his house) Ah, Christmas Eve! When all of Bikini Bottom is filled with good will. SpongeBob: More like bad will! Gosh, if people don't start acting nicer, Santa's going to fly right past Bikini Bottom this Christmas Eve. I'm gonna need some help. (He knocks on Squidward's door) Squidward! Squidward: (From inside) I'm not home! SpongeBob: Oh gosh, what do I do now? Squidward: Why don't you go bother Sandy? SpongeBob: Sandy, Sandy! I need your help! It's Christmas Eve and everyone in Bikini Bottom are acting like jerks! You gotta help me find out why. Sandy: (Turns around and bares her teeth, scaring SpongeBob) Why should I help all them jerks? SpongeBob: Because those jerks don't care about Christmas any more, Sandy! It's a problem. SpongeBob: Oh, the problem isn't the fruitcake! (He snatches it from her) The problem is that everyone, including you, is acting like a jerk! Oh, I'll have to solve this on my own. (He turns to leave and slips on a nut, accidentally throwing the fruitcake into Sandy's Christmas analyser) Whoa! Sandy: Dagnabbit, SpongeBob, you got fruitcake in my Christmas magic analyser! (An alarm sounds) Well, I'll be a hornswaggle. My analyser's found something in the fruitcake! (She looks at the reading and gasps) This is terrible! SpongeBob: What is it, Sandy? Sandy: The fruitcake is contaminated with jerktonium! No wonder I've been as ornery as a sidewinder on a hot driveway. Jerktonium is the orneriest element of them all and your fruitcake is full of it. Where'd you get that fruitcake, anyway? SpongeBob: From Plankton, he baked it. Sandy: You took food from Plankton and fed it to everyone in town? Sandy: No wonder everyone in town is a big old meanie. SpongeBob: (Jumps up in panic) Oh! I've eaten tons of that fruitcake! I must be the biggest jerk in town! Sandy: (Pokes him) Hmm … you don't act jerky. For some reason it's not affecting you. (She puts a scanner in front of him) It must be a combination of your tiny brain and pure heart. You're immune to jerktonium, SpongeBob, but the rest of us will need an antidote. I'll set the analyser to calculate the formula … (She pulls a switch and a music score pops out) Why, this formula for the antidote don't make no sense at all! SpongeBob: Hmm … that's not formula! That's a song! (He hums it, and Sandy becomes her normal self) Sandy, the song is the antidote! Fish: Oh yeah? Well your fins are fat! SpongeBob: (Floats down from the sky) Ahoy, everybody! (He clicks his fingers and mistletoe appears over the heads of Fish and Fish 2, curing them of jerktonium poisoning; he clicks again and a pile of presents appears, curing two other fish; a little boy begins to play Christmas baubles like bells; SpongeBob sings) Bring joy to the world, it's the thing to do, but the world does not revolve around you, don't be a jerk, it's Christmas! (Throws a snowball at Mr Krabs and cures him) Be nice to babies and animals, old folks, too (Puts an old person on a seahorse with a baby) 'Cause that's how you'd like them to treat you! Use turn signals, don't screen my calls, don't you wreck the house when you deck the halls. Spit your gum where it won't wind up on my shoe (Steps in gum and trips onto a tube of toothpaste), squeeze toothpaste from the bottom of the tube,don't be a jerk, it's Christmas! (Uses the toothpaste to brush a kid's teeth) It's Christmas! (Hands a gift to Pearl, who continues to pass it down a line, curing people as they receive it, except for Squidward, who is unaffected) Dahaha! When others are talking never interrupt, don't put people down (Flushes Plankton down the toilet and closes the lid) or leave the toilet seat up. It's the time for family and holly and turkey, 'tis the season to be jolly not jerky! Mr Krabs, Squidward, Patrick and Sandy: Jolly not jerky! SpongeBob: (Climbing a tower of gifts) Santa brought nearly every gift on your list, why whine about the one that he missed? (Walks off the end and falls onto a giant wreath being held by the other main characters) Don't be a jerk, it's Christmas! It's Christmas! Don't be a jerk, it's Christmas! Sandy: Congratulations, SpongeBob, your song worked! SpongeBob: And not a moment too soon. Santa should be here any minute. SpongeBob: Oh, boy, Santa! You made it! Santa: Whoa-ho-ho-ho-ho! Cool your jets there, son. I'm afraid I'm the bearer of bad tidings. Santa: Oh yes. It seems you're all on my naughty list this year. Santa: No buts about it. You've all been a bunch of jerks. Santa: But nothing. Coal for everyone! (Takes out a sack of coal) Except Plankton. Mr Krabs: Me secret formula? How did you get that? Mr Krabs: Huh? (Slaps the elf) Get out of me pocket, you foul goblin! SpongeBob: But- but- but- but- but- but- (Patrick slaps him) But Santa, you've got it all wrong! ToyBob: (Focuses on SpongeBob, Plankton and Santa) I am ready to destroy Christmas! (He transforms into a bigger robot) Destroy Santa! Santa: I'm outta here. (He hides in the Krusty Krab, but ToyBob finds him and picks him up) You do realise this counts as “naughty”? Santa: Thanks again for saving my keister. SpongeBob: Oh, it was nothing. Santa: You're clearly a very good lad, unlike the owner of that wind-up monstrosity. (An elf hands him the wind-up key) What have you got there? (He reads it) If found, please return to the Chum Bucket. Plankton! SpongeBob: Hey, has anyone seen Patrick? Patchy: (Notices a sign) Santa's workshop? I'm here, Santa! I'm here! Potty: I'm not going in there. Santa: (With Potty) I think stealing a mail truck definitely counts as “naughty,” wouldn't you say, Potty?